When I was building the Seal theme bouzouki, I made another body with the same rosette and a spruce top rather than a Western red cedar top. 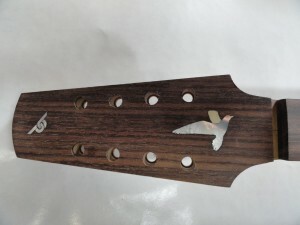 In keeping with the theme of the rosette (rocks and bull kelp), I have inlaid a hermit crab, rockfish, salmon and seagull into the fingerboard and headstock. This bouzouki is almost ready to spray finish on.